Intramuros is known as the “old” Manila as the enclave was practically The City when the Philippines was under Spain. Streets are generally narrow as they were designed at a time when there were no motor vehicles like automobiles, jeepneys, buses or trucks. People walked or rode on horses. Luxury vehicles were carriages while goods were carried by carts or people. The following photos show the stretch of Muralla Street from the Victoria Street (Bayleaf Hotel) to Real Street (Lyceum University). 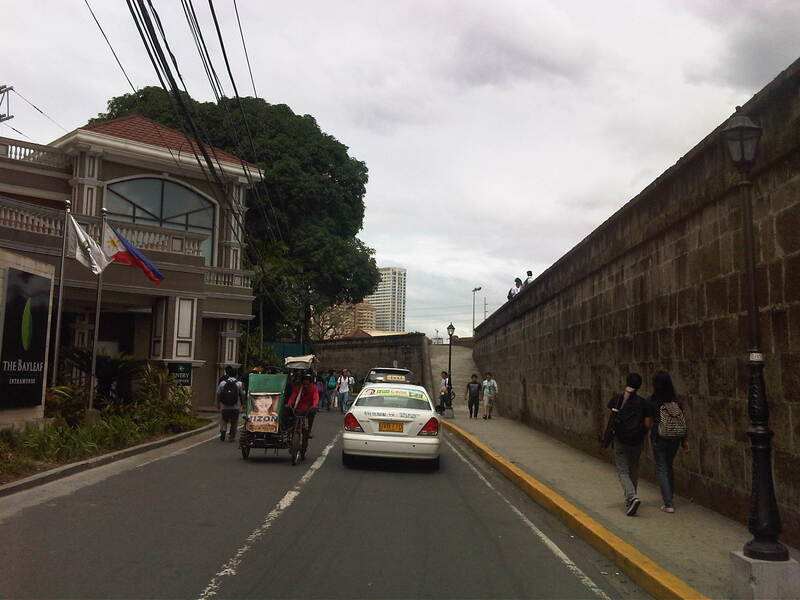 Muralla Street runs along the eastern wall of Intramuros. It is a one way street and so the photo shows a pedicab (also called padyak or sikad), a non-motorized tricycle, running counter to the flow of traffic. These streets were made for walking – Intramuros has narrow streets and can barely accommodate two way traffic so many have been designated for one-way flow. There are schools along the left side of the road including the Mapua Institute of Technology, Lyceum University and Colegio de San Juan de Letran. As such, there are usually many students in the area walking around, having their meals at the nearby canteens/eateries (right side) or perhaps just sitting and admiring the view from the top of the wall. Parking is a major problem in Intramuros and one would see vehicles parked along one side of the street (evident in most of the photos in this post), obviously taking valuable space away from people and other motor vehicles (i.e., reduced road capacity). There are many eateries or small restaurants along Muralla St. and just under the wall. These are patronized mainly by students so meals are inexpensive. There are many pedicabs in the area with long queues at the gate waiting for passengers coming from the general direction of Padre Burgos Ave., where people can transfer to and from jeepneys serving the area. Frankly, I think there is an excessive number of pedicabs in Intramuros considering roads in the enclave can be transformed into walkable streets, just like they were during the Spanish and American periods. Notice again the on-street parking along one side of the road. More students and more pedicabs along Muralla Street. People are used to traffic mix and generally stay clear of the space allocated for motor vehicles. Security personnel posted along the walls are appropriately dressed as Katipuneros or Rayadillos (honor guards). 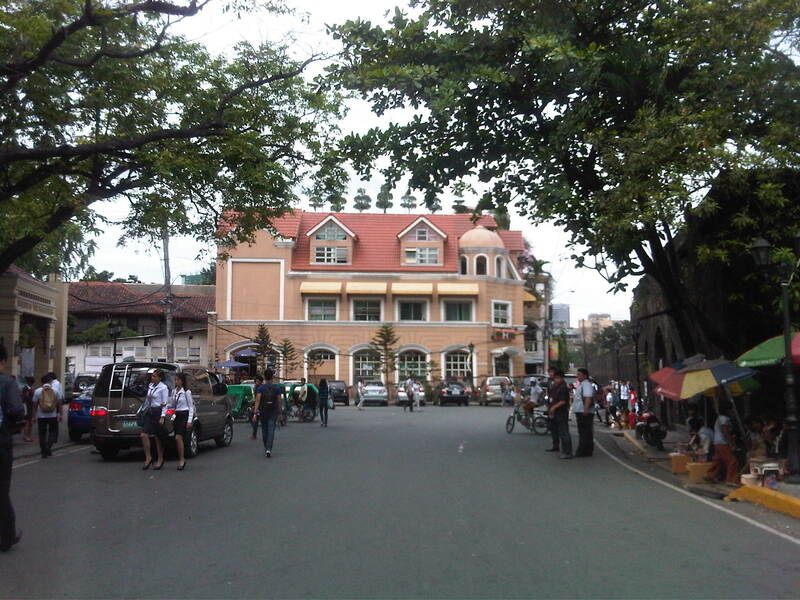 The building down the street is a dormitory just beside the buildings of Lyceum University, whose buildings are split up by public streets making it tricky to define a campus for the university. Junction of Muralla Street and Real Street with a private dormitory building at the center of the photo. Muralla Street continues along the side of the wall and proceeds all the way to Plaza Espana and the old Intendencia. Meanwhile, Real Street proceeds to the left of the dormitory. Also shown at the left is the entrance to one of the buildings comprising Lyceum University. Other buildings are behind the dorm. By d0ctrine in Governance, Highways and Streets, Land use, NMT, Pedestrian on June 25, 2013 .